During the third week of the Easter holidays, Student Volunteering Bangor (SVB) held its first residential volunteering opportunity for Bangor University students. 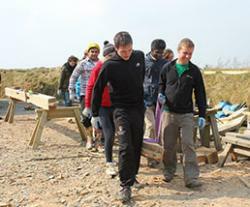 Eighteen Bangor students and two from Aberystwyth University joined forces to spend a week working at the Felin Uchaf centre near Aberdaron on the Lleyn Peninsula. Felin Uchaf is a land based social enterprise which explores and promotes ways of living in creative partnership and harmony with the environment. Since 2004 the charity has been transforming a traditional Welsh farmhouse and surrounding land into a vibrant visitor and community enterprise. Their aim is to help generate and support new green business initiatives and rural enterprises that make responsible use of the area's natural resources. Volunteers from Student Volunteering Bangor, which is part of Bangor University Students' Union, assisted with the erection of a new timber framed building which it is hoped will accommodate a new library, archive and visitor centre. Daryl Hughes, fourth year Conservation & Forest Ecosystems undergraduate said that "SVB could have hardly chosen a more inspiring location than Felin Uchaf for its first ever residential. The staff are welcoming, the landscape is beautiful and the diversity of on-going projects is impressive. It was fantastic to get involved in the construction of the new Visitor Centre which is being constructed from green oak timber using traditional techniques. Overall the team spirit was great and everybody had fun pitching in and learning new skills”. Students also took part in various land management tasks such as willow coppicing and erecting dry stone walling, planting and traditional cooking. Working together became a high point for many of the volunteers. “It was a pleasure to see students from different backgrounds and cultures come together as a team to undertake the work at Felin Uchaf. Having the support of such a large group was incredibly helpful to the organisers” said Sion Rowlands, SVB Project Officer and organiser of the residential event. Student Volunteering Bangor would like to thank staff and volunteers at the Felin Uchaf centre for their warm welcome and for their contribution to this residential volunteering experience.